"Bring us the groundhog!" shouted the angry mob, holding their torches and pitchforks. OK, OK, that's not at all what's going on. But that might be the next inevitable event if this crappy weather continues any longer. The Monroe County Sheriff’s Office has made national news, calling for the arrest of Punxsutawney Phil for an allegedly deceptive weather prediction. 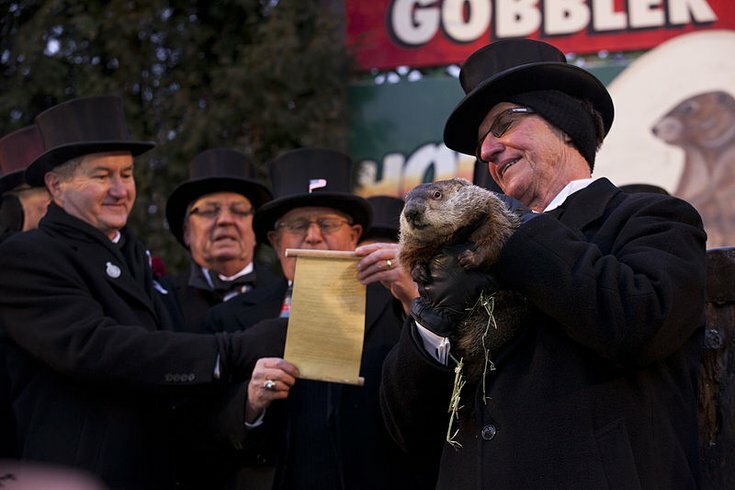 If you're not familiar with the annual ceremony on Groundhog Day in Punxsutawney, Pennsylvania, here's a quick refresher: People get up really early to watch a long song and dance before a bunch of men in fancy outfits come out and present a groundhog. The groundhog, Phil, either sees his shadow — which means six more weeks of winter — or doesn't — which means an early spring. Phil saw his shadow this year, predicting more winter. However, as the Monroe County Sheriff's Office correctly noted last week, Phil's prediction should have expired on March 16, six weeks after Groundhog Day on Feb. 2. This was wrong, as another large snowstorm slammed the Northeast shortly after the official start of spring. Hence, the call for Phil's arrest on charges of deception. The office's post has since gone viral, getting more than 4,000 shares and making national headlines. The good news? At least in Philly, temperatures are expected to be mild this week with some scattered rain, so maybe we can leave the groundhog alone until next year, when we'll once again blame him for Mother Nature.